Your success starts with seed. And while you don’t have a crystal ball to see what next year’s conditions will be, you won’t make a bad decision if you rely on data. When you spend hundreds of dollars on just one bag of seed, you deserve to know how that variety will perform in your particular environment. While success starts with selecting the right seed, seed selection starts with understanding your field variability. The R7® Tool from WinField provides maps based on satellite imagery that help you understand the historical, in-season and soil variability in your fields. This information serves as a guide for hybrid selection, planting population and agronomic planning. You need all three to work in harmony to discover the full potential of your fields. Understanding field variability is only one part of the equation when it comes to making the right seed decisions. Incorporating precise, highly localized data, along with information on seed characteristics, can help you develop customized prescriptions for your operation. The R7® Tool contains two unique features that provide data from the Answer Plot® Program in a manner you won’t find anywhere else: the Top 10 function and Corn Characterization Charts (CHT Tool). 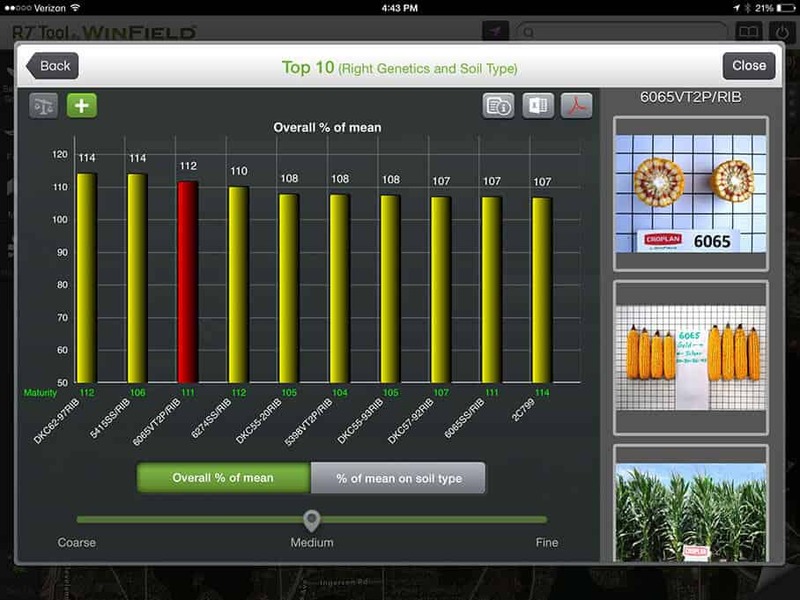 The Top 10 function lists the 10 best-performing corn hybrids or soybean varieties based on soil type in a selected location, allowing you to identify the best genetic choices for your specific fields. For example, information on corn hybrids listed in the tool include yield potential and response to soil type, as well as ear, stalk and root photos of that hybrid in different planting and fertility environments. The CHT Tool lets you use data to make detailed comparisons of seed from a variety of companies. These comparisons take into account soil type, crop rotation, plant population and management practices such as the level of fertility and type of tillage. And, because the hybrids have undergone numerous side-by-side comparisons, field variability has been virtually eliminated in the data. This level of specificity is something no other ag company can offer.